Ah, makeup. We all have different ideas and attitudes toward it but one thing’s for sure, we love a good deal when it comes to liners, palettes, and so on. I have rounded up some of the essential items everyone needs in their vanity– items on the Indian market that are affordable, and even great dupes (duplicates) of some of the most iconic makeup items out there. Whether you’re going to splurge or save, there’s an essential out there for you. So let’s get started! Tinted moisturiser is as the name suggests– it’s moisturiser and it has a tint, to match your skin tone. It’s not as heavy as foundation, and is meant for light to medium coverage. I think when you’re new to makeup, you don’t need to invest in heavy duty foundation. Tinted moisturiser is a great place to start. Once you begin using makeup more regularly, switch to a good foundation. Before I used my current foundation, I had the Laura Mercier Tinted Moisturiser, which is a cult favourite– and for good reason! It is easy to apply, doesn’t look artificial & makes your skin look fresh. Unfortunately, it is on the expensive side & not readily available in India and South Asia. The confusing nature of BB & CC creams aside, this product is similar to the Laura Mercier but at a fraction of the price. It has built in SPF and doesn’t make skin oily. Rs. 250 on Flipkart but I would suggest buying such products in person for the best skin fit. I’m very picky when it comes to eyeliner. Thanks to my obsession with winged liner, I look for a product that’s easy to apply and has good pigmentation. Favourites have come and gone but I currently love Lakme Absolute Shine Line. It’s got a thin brush applicator and lasts for a long time on me (5+ hours). The colour is good, a true black, and serves cat eye purposes well. You also get a lot of product. I have this in a silver colour too, and that’s a wonderful alternative to classic black eyeliner. You can’t go wrong with this– considering the eyeliners on the market that are more than 500 rupees for the same amount of product, this is Rs. 325 and currently on sale here. A true test of eyeliner? It has to outlast my dance classes. I have tried the Bobbi Brown Long Wear Gel Eyeliner and it is truly long lasting and deeply pigmented. Another reason why I like gel eyeliner is because it’s easier to apply than liquid. But Bobbi Brown is another expensive product (totally worth the splurge, nevertheless). But fear not. This eyeliner is basically the SAME as the Bobbi Brown one. It lasts just as long, and almost as pigmented on the first pass. The only difference is in the brush but you can get the same results. And for Rs. 475, this is another steal that I can vouch for. Buy it here. On days when you can’t bother with eyeliner or anything else, mascara makes you look wide-eyed instantly. Don’t ask me how, I don’t know. But it works on a bare face. It also adds a little extra drama on a made-up face. It’s a hugely underrated product especially among Indians (from what I’ve seen). I got this Urban Decay product as a sample and I have been loving how it makes my lashes look thicker and longer. The colour is true black and lasts until you are forced to scrub it off your eyelids (true story). Urban Decay is one of my favourite brands, ever. Too bad it’s expensive. Picked this up on a trip to Malaysia and it served me well. Visible results that aren’t fake, they add the drama your eye makeup needs without being over the top. Totally recommend! Buy here. Eyeshadow is one of my favourite products ever. It is versatile, and makes so much more difference in all your looks, whether you’re going for a natural look or a made up one. While I was very attracted to bright colours when I started using makeup, I realised the amazingness (is that even a word?) 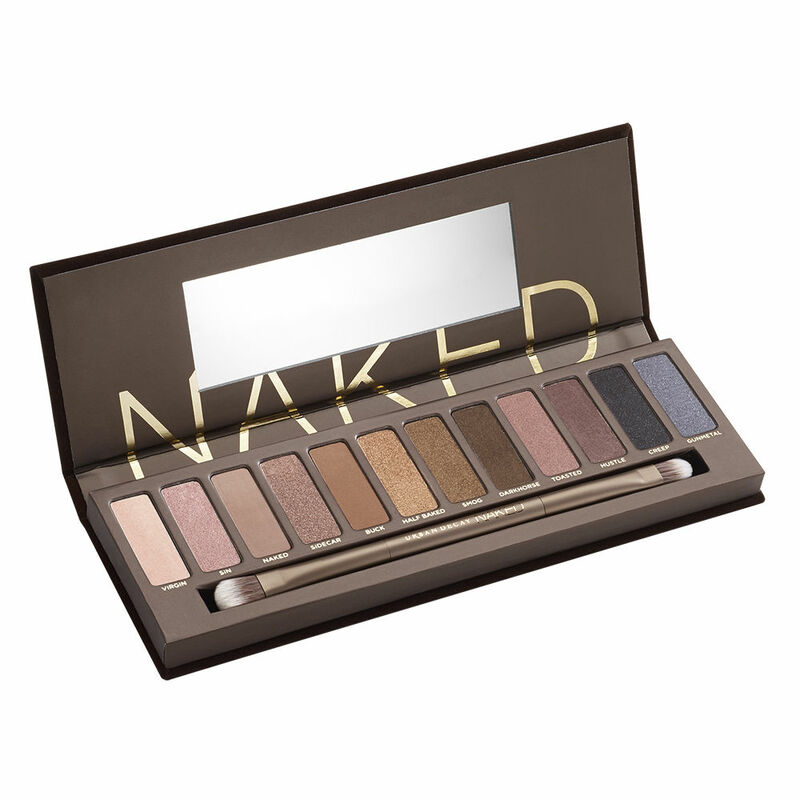 of a neutral palette with the Urban Decay Naked- a cult classic that I have grown to use the most. Look no further for a holy grail of eyeshadows that are pigmented, long-lasting and suitable for everyday wear. If you have a cousin coming from the USA, I would HIGHLY RECOMMEND buying this. It works on every skin tone, especially Indian ones. There are 3 Naked Palettes to choose from. I have the original Naked, pictured above. Of course, you also need $54 dollars to spare. So if you want a cheaper version to cement your first steps in makeup, I have it! I couldn’t believe when I chanced upon these palettes on Jabong. They’re almost ditto to the Urban Decay ones for a fraction of the price! Iconic-1 is a dupe of Naked 1, Iconic-2 is Naked 2, and so on. I haven’t used this product myself, but the reviews on the internet are all positive. Go ahead, take the plunge with this neutral palette; you can’t go wrong! Buy it here. There are tons of reds on the market. It’s a classic shade, while a little scary to wear for the first time. My expensive pick would definitely be Stila Stay All Day Liquid Lipstick in Beso. It looks like lipgloss, even applies like it, but dries matte quickly and stays on for AGES. You only get it in the USA though, so that limits my window of opportunity. Another good choice would be MAC Lipstick in Ruby Woo, which is available in India. But a dupe? An almost exact dupe of MAC Ruby Woo, the Lakme 9 to 5 range matte lipsticks are a great deal for their price. They are truly matte & last long. Their variety of colours doesn’t hurt either– if you’re looking for a neutral, try the colour Pink Slip. The biggest fear of buying a red lipstick is that of not wearing it again. But a red is what you truly need– and it’s a lot more versatile than you think. So go ahead, buy it on Amazon. I guarantee, there’s no looking back. I hope you enjoyed my makeup essentials post! What are your essential products? I have never used make up before and thought I should start with some basics. Got most of them mentioned in the post and I am loving it. I got the bronze one in CC cream, suits the dusky skin.